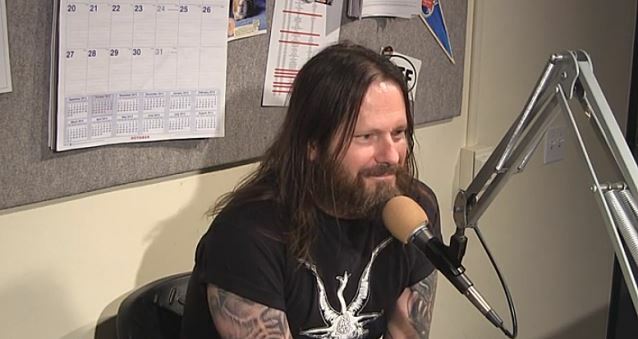 EXODUS mainman and current SLAYER touring guitarist Gary Holt was recently interviewed by "Metal Zone" host Nikki Blakk of the San Francisco, California radio station 107.7 The Bone. You can now watch the chat below. A couple of excerpts follow. Holt: "After this upcoming October/November SLAYER tour, I'm off from that band until next April. So I have this window of opportunity [to work on a new EXODUS CD]. So we're gonna make the album, we're gonna make it happen, whether it kills me or not. We're looking at February to start [recording]. Holt: "I'm heavily in riff mode [right now]. It's always hard to gauge where a record's going right away, but you kind of get a feel for where you're headed mentally, and right now it's really fast. It's ridiculous." Holt: "[There is] nothing that I know of at all. I just know that I have a nice, big gap to do the EXODUS thing and get the [new] album done. So myself and the whole [EXODUS] band, we're dedicated and committed to making it happen, because [the SLAYER] train may start rolling again, and then I don't have that several-month break to make it happen. Holt: "At times, you feel like you're being pulled in two different, playing with two awesome, legendary bands. But long-terms plans [for EXODUS] are just to keep making records, keep striving to make a better one than the last. [Make it] heavier — always heavier."